Blog YouthBiz - It's a Wrap! YouthBiz – It’s a Wrap! It’s the end of the school year and YouthBiz students have accomplished quite a lot! Students at Wyatt Academy, Kepner Beacon Middle School, Grant Beacon Middle School and Annunciation Catholic School completed their YouthBiz Startup classes with a business pitch competition for a chance to win $100!! The business pitch competition at Wyatt Academy was small but mighty. The business idea that won the competition was Roboto, a robot that will help with people with handicaps by getting things for them. The young entrepreneur behind Roboto hopes that his idea will also be used in hospitals as a way to help nurses and doctors with their patients. A robotics class taken last year inspired this young entrepreneur to apply his robotics knowledge to starting a business. Judges Sara Hilsendager (Amica Insurance) and Jake Calzavara (Anadarko) were extremely impressed with the idea and the amount of passion and knowledge presented. Kepner Beacon had seven businesses presenting to a panel of judges: Rene Gates (Onyx Data Solutions), Mike Havlik (Brownstein Hyatt Farber Schreck, LLP), Matt Mattson (Honeypot) and Jim Doolittle (Purchase Power LLC). Business presentations ranged from soccer shoes that provide energy to a new game board concept. The winner was Ellipse Pens, a pen and pencil in one. The win wasn’t easy though. With a tie between the Izzle Pizzle soccer shoe and Ellipse Pens, we had to bring in an independent third party to break the tie! At Annunciation, the competition was just as fierce. Business ideas included drones, slime, and car alarms, but cousins Gia and Giana teamed for the winning business, Cat House. 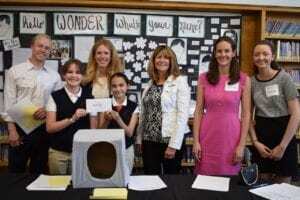 This comfy respite is perfect for cats and kittens, and the prototype really wowed the judges: Janessa Biller (JLL), Luke Naes (US Trust), Michelle Workman (Trelora Real Estate,) Brittany Aylmer (Amica Mutual Insurance) and Chrissy Sollenberger (Techstars). At Grant Beacon seven businesses teams tackled practical consumer issues with tips for acrylic nails to facilitate cell phone usage and a humidor for dried out markers. Travelers might benefit from business ideas that ranged from a heating and cooling lap blanket to a mesh backpack with built-in charger and even a candle-powered popcorn popper for campers. In the end, Judges Appel Lipsius (Teatulia Tea Bar), DanLourenco (Caliber Home Loans), JakeCalzavara (Anadarko) and ChristinaPoole (Keller Williams Realty Downtown) selected Addison for her automatic pet food/water dispenser with innovative sanitary stainless steel bowls as the final $100 winner in this Spring’s Youth/Biz pitch competitions. Overall this year, has been great! We’re really appreciative of the school partnerships as well as the wide experience of judges from different businesses and industries in our community. This program wouldn’t be possible without these terrific volunteers. We’re not completely done, though, and we still have a few openings for our entrepreneurship summer camp at Highlands Ranch June 18th. Sign up now for your chance to win $100! !